Why give a lump of coal to that naughty person on your Christmas list? For ultimate fun give them some fossilized dinosaur poop. 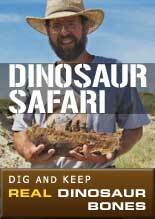 Yes it�s the real deal all the way from the Jurassic of Utah. These pieces of agatized fossil poop (Coprolite is t he official name) have been tumble polished to make it look good. Did we say good and poop in the same sentence? Sure to get a laugh. This ordinary looking rock is actually fossilized dinosaur poop or dung with a formal name of Coprolite. The dung was fossilized much like any other bone, shell or plant. This Coprolite has been replaced during fossilization by the mineral Agate. 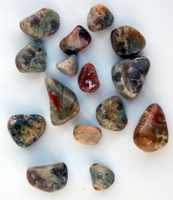 Agate is a cryptocrystalline variety of the mineral Quartz (SiO2. In a polished cross section paleontologist such as Dr. Karen Chin (see National Geographic Magazine January, 1993 can often see undigested bits of bone and plants that were part of the dinosaurs diet. This fossil Coprolite which has been cut and polished or tumble polished is from the Jurassic Age rocks of Utah which is 140-200 MYA years old.